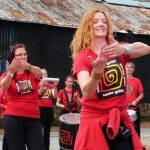 Samba Galêz has a large and experienced membership with members aged between 18 and 81, and some who have been in the band for over 25 years! We perform all year round – spring parades, summer carnivals, autumn festivals, winter wonderlands – whether it is sunshine or rain! We also enjoy impromptu busking in Cardiff city centre. It’s a social band, with various sub-groups who go cycling, hiking, play music, or just hang out. We also arrange a weekend away twice a year to a countryside break to socialise with a change of scenery. The band is led by Simon Preston and the dancers by Sallie MacLennan. We have appeared on TV many times, and in the short film Samba Paloma. The band has also produced two CDs, with more in the pipeline.